Internationally beloved poet Naomi Shihab Nye places her Palestinian American identity center stage in her latest full-length poetry collection for adults. The collection is inspired by the story of Janna Jihad Ayyad, the "Youngest Journalist in Palestine," who at age 7 began capturing videos of anti-occupation protests using her mother's smartphone. Nye draws upon her own family's roots in a West Bank village near Janna's hometown to offer empathy and insight to the young girl's reporting. 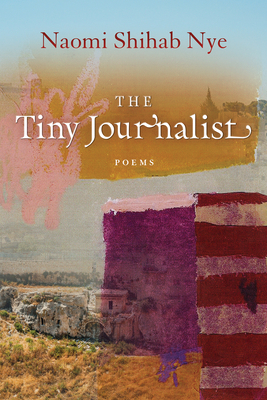 Long an advocate for peaceful communication across all boundaries, Nye's poems in The Tiny Journalist put a human face on war and the violence that divides us from each other. Happiest on a tractor named Mabel (a muse of 55 horsepower) Lucy Griffith lives on a ranch beside the Guadalupe River near Comfort, Texas. As a poet and essayist, she has work in Bearing the Mask: Southwestern Persona Poems and Weaving the Terrain: 100-word Poems of the Southwest. She is co-editor of Echoes of the Cordillera: Attitudes and Latitudes Along the Great Divide, an ekphrastic anthology. She was a contributor at Bread Loaf Writer’s Conference in 2018. Lucy Griffith opens We Make a Tiny Herd with La Reina, the lens with which I will always view the burro lady, a woman “full of thousands of sunsets, and brimming with stars.” It is in the last stanza of this poem that Griffith sets herself a task for the collection, “From you, I only ask respect: do not lay your story over mine.” Speaking for the burro lady in this poem, Judy Magers, this is quite clearly the bar Griffith holds for herself throughout the book. It is evident in her lyrics she feels charged to protect and uphold the memory of this regal and independent woman. About midbook, Griffith artfully reminds us of how little we know in an aptly named poem, “What I don’t know.” The title line repeats quite often as if to remind us there is so much we never know about others and we must respect that. Even what we think we know is only that, a thought. She reminds us to be respectful of others by keeping their essence safe and intact, to always speak with kindness and reverence. Griffith’s ancestral and personal history as a storyteller reveals itself consistently throughout We Make a Tiny Herd. While it is not ordered chronologically, there’s never any doubt as to its narrative arc. Unfettered by complicated language, the voice of Griffith, West Texas, and La Reina come through clear and cool to lay this story down so intentionally that I cannot remember ever not knowing the tiny herd.